Every Jaguar can do things machines can’t. German ad of global ad campaign by Spark 44, to be launched in March 2013. Extraordinary novelty. Its magic is nothing so new now is it? What to do, when the expectations are set too high, as with Jaguar and Spark44? Ignore everything is Hugh MacLeod’s advice. Definitely ignore set expectations is mine. Avoid disgrace, cut out what’s not neccessary. Over-ambitiousness is a breeding ground for disgrace. 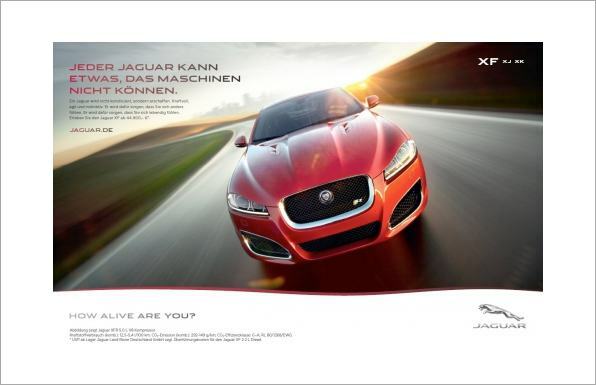 The German print ad is what our Jaguar friend aches to see. A brilliant image of the fantastic new Jaguar car. If only the headline was replaced by the model name in readable type. There it is, the self-degrading over ambitiousness, we ad practitioners are so familiar with, in our fear of delivering on the expectation of something original. The mostly unnoticed switch from British racing green to multicolored India flavors. Mumbai Jaguar is extraordinary novelty. Capture the Jaguar car in the wilderness of India. Have the pictures tell the story. Bring some Brits into the picture. Richard Hammond, Noel Gallagher, James May, Fergus Henderson, Jeremy Clarkson. Replace the copy with the audience’s speechlessness. Do what the Beatles did when reinventing themselves as Sgt. Pepper’s Lonely Hearts Club Band. We Jaguar drivers are lonely people. See what Angela Ahrendts and Christopher Bailey did to bring the art of trench into the new world. Spark44 is a joint venture of owner Tata Motors, part of Tata group in Mumbai, who also aquired Rover. What good is a newly founded, dedicated agency, when the same good old boys network carry over their old world fears to the new venture? Jaguar waves to the machines. Product, product, product. Rely on it. Bollywood short films directed by Wes Anderson. Don’t forget the rallye decals on Jaguar car (think of the vehicle decals in Vanilla Sky). Lock into the cognitive surplus of the fifty-something. See also the mixed reactions this launch is receiving for it’s execution here. An article in the NYT by Jane L. Levere well worth the read. Learn more about indeciveness, inherent also in Microsoft surface here.